The President of the Iranian regime said that the US was “committing crimes against humanity” with sanctions on medicine and food adding that Iran’s Judiciary should prosecute US leaders inside and outside Iran. This is while sanctions have not been levied against food and medicine. However there were previous reports on state-run media that Iran was shipping tons of medical supplies and medicine to neighboring countries like Iraq. Speaking in the southern province of Bushehr on Sunday, Hassan Rouhani cited the unprecedented economic pressure on Iranians saying that they were the result of “pressure from the enemy”. “The Iranian nation will continue its success and will use the divine blessings at the disposal of the people for development and progress”, he added. The regime’s president also boasted the launch of four other phases in the South Pars natural-gas condensate field. 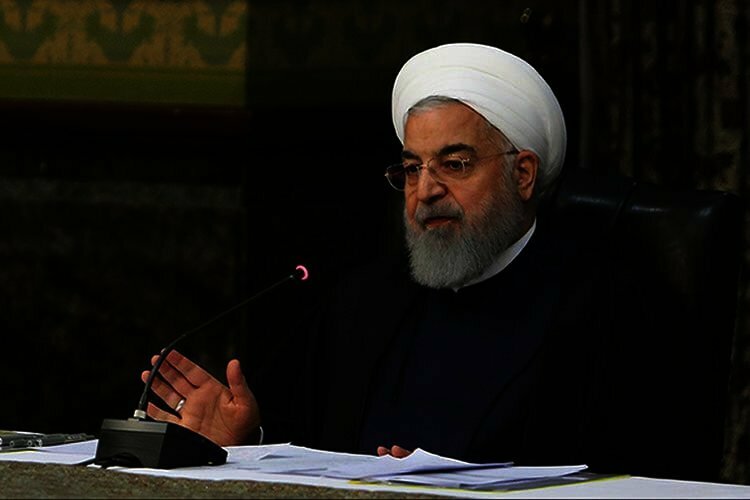 However, Rouhani failed to mention that the contract workers of phase 20 and 21 working in the southern port of Asaluyeh had not received months of their wages and had held numerous protests in 2018. Like all other regime officials he blamed “the enemy” for all of Iran’s problems. Rouhani praised the regime’s policies, the product of the decisions of Iran’s all powerful Supreme Leader, Ali Khamenei. “The path that we have chosen is right and we will continue on this path,” the President of the Islamic Republic said. Rouhani boasted “development and progress” even while according to Bloomberg, U.S. officials have said the global oil market can withstand the removal of all Iranian crude exports this year. “This could be pivotal in the coming weeks as President Donald Trump weighs whether to end sanctions waivers granted to several nations,” Bloomberg wrote. According to the website, four US officials who spoke on condition of anonymity said that, “based on current oil supply and the potential of the U.S. and Saudis to ramp up production, ‘going to zero’ could happen this year without compromising affordable crude supplies”. According to the International Energy Agency, OPEC has 2.8 million barrels a day of spare capacity, more than enough to offset Iranian supply losses. During his remarks, Rouhani admitted that the US led oil sanctions were working and said that Iran was experiencing “war-like conditions”. “Today we are in a war field and the US is committing crimes against humanity,” he said. Regime officials are experts when it comes to twisting the facts. It is ludicrous that a regime that has an abhorrent human rights record, systematically discriminates against women and religious and ethnic minorities, executes and tortures political dissidents while pocketing the wealth of the Iranian people now wants to persecute the US for sanctions; Sanctions that are curbing its ability to finance terrorist activities and to fuel instability in the region.